This Bird is about the size of, or somewhat bigger than a Lark. The Crown of the Head is black; the Upper-part of the Body, Wings and Tail, dark brown; particularly the Tail approaches nearest to black. The Neck, Breast, and Belly, are of a lighter brown. From the Vent, under the Tail, shoot forth some Feathers, of a dirty red. 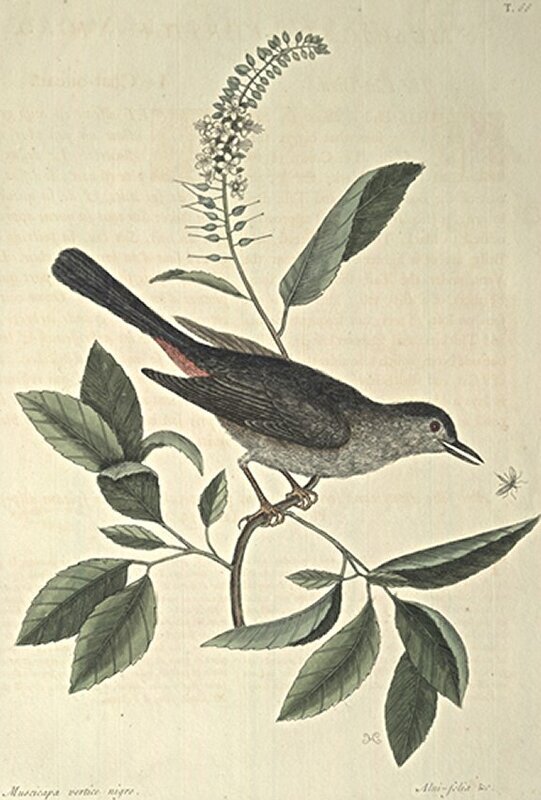 This Bird is not seen on lofty Trees; but frequents Bushes and Thickets; and feeds on Insects. It has but one Note, which resembles the Mewing of a Cat, and which has given it its Name. It lays a blue Egg; and retires from Virginia in Winter. This Shrub grows in moist Places, and sometimes in Water, from which it rises, with many slender Stems, to the Height of ten or fourteen Feet. The Leaves are somewhat rough, placed alternately, serrated, and in Shape not unlike Those of the White Thorn. In July there shoots from the Ends of the Branches, Spikes of white Flowers, four or five Inches long. Each Flower consists of five Petals and a Tuft of small Stamina. These Flowers are thick set on Foostalks a Quarter of an Inch long; and are succeeded by small oval pointed Capsu1a's, containing many chaffy Seeds. This Plant endures our Climate in the open Air; and flourishes at Mr. Christ. Gray's in Fulham.